Wand’s last two releases, 2017’s Plum and 2018’s Perfume EP, meshed Cory Hanson’s touching, beautiful melodies with ramping psych riffs. The Drag City Records psych-leaning five-piece is set to release their latest full-length, Laughing Matter, on April 19th and they made an appearance at Hotel Vegas for the Levitation showcase. Playing lots of new material, Hanson and co. brought zigzagging guitar jams (sometimes with a violin bow in hand) and melodies with an alluring, warm purity. Hanson’s delicate psych croon and wintery backing vocals from keyboardist Sofia Arreguin sounded sublime when paired together, and the Los Angeles-based Wand proved to be a charming, soothing oasis from much of the freakier psych rock acts on the bill. Laughing Matter offers bits of fuzzy parable, travel diary, pep talk and lullaby, amid a joyous, eclectic sense of pastiche and ascendant choruses. Wand form new music from the ashes of a world that can no longer suffer its human abusers, to inspire us to hold the spirit close and do what’s next. For a sample of these new reaches in the Wand-iverse, look no further than the track “Walkie Talkie”, the third pre-release single and latest video from Laughing Matter! 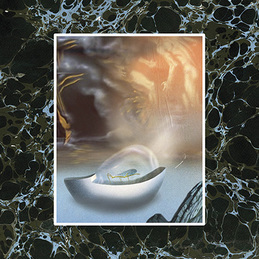 Lookin’ like it might’ve beamed in directly from sideways post-punk pastward futures, “Walkie Talkie” shines brightly with the reflective sheen of Wand’s modern flicker. Muted neon colors swallow seething imagery as Lee Landey and Evan Burrows‘ emphatic rhythm section slams into Cory Hanson and Robbie Cody‘s screaming guitars, whilst Sofia Arrequin‘s warped Morse keyboards sew the song together at the edges. “Walkie Talkie” is a wheelhouse Wand jammer, a barely-contained swarm of alien and uncanny tones driven to the maximal edge. Track from the Wand album “Laughing Matter,” available on 2xLP/CS/CD from Drag City on April 19th, 2019.